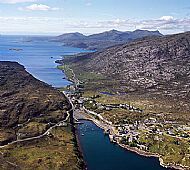 A tarbert (sometimes spelled tarbet) is a neck of land between two navigable stretches of water. This word more specifically refers to a narrow piece of land over which a boat could be drawn, and is derived from the gaelic meaning 'across' and 'carry'. The photo shows the tarbert between the islands of Harris and Lewis in the Western Isles. The jetty you can see on the lower (eastern) side of the tarbert is used by the ferry which plies between Uig on the Isle of Skye and Tarbert. In this case, as in many others, the village is also given the name of Tarbert. As you may imagine, the west coast of Scotland in particular has many tarberts, and these are often places of settlement. My atlas of Britain includes seven Tarberts/Tarbets as place names in Scotland, so it is necessary to be clear to specify which Tarbert is meant.